User Logon Reports provide an Active Directory user account’s logon information i.e. the date and time when a user logged on to the Windows network in a hassle-free manner. This information is crucial for network administrators to track AD users' activity in the Active Directory environment and find out who all have not logged in for a specific period, list all remote user logons, monitor users' true last logon time including logon date, logon / login time to perform tasks like removing or cleaning up the inactive or disabled users, change the allowed logon times, etc. in bulk. The native tools of Microsoft Windows Active Directory, PowerShell, etc. do not provide the real last logon information from multiple domains, as any one of the domain controllers might have authenticated the user login and the replication of 'logon data' would not have happened between them. These Windows 2000/2003 last logon reports, the generation and exporting of which can also be automated, can enhance enterprise management by fetching accurate login information of users from the Active Directory set up of your organization. 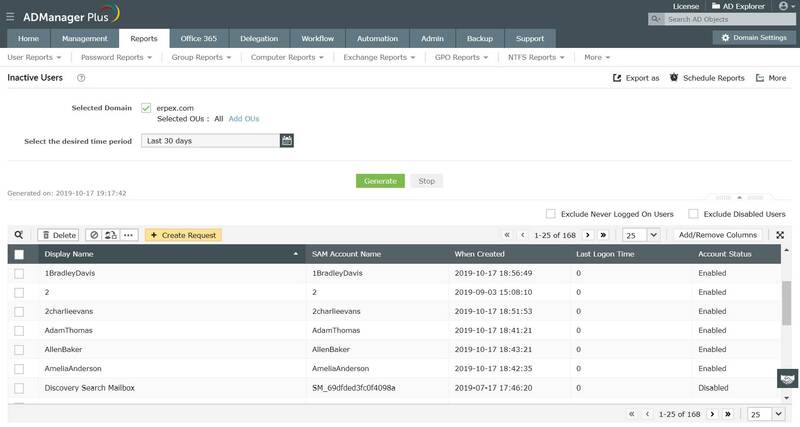 Since ADManager Plus is web-based, it enables you to perform remote Active Directory management and reporting. Make use of this software's free download of the 30-day trial to explore in detail about how these reports can help you manage the user accounts better. The Recently Logged On Users Report provides details of all Active Directory users who logged on during the past 'n' days. AD users who logged in recently are determined based on their last logon / login time. All the configured domain controllers are scanned for the last logon time of users to ensure accuracy. The Real Last Logon Time Report lists the true last logged on time of users. In other words, it displays the actual date and time when the users last logged on to the network. The detail is extracted by querying all the configured Domain Controllers so as to ensure data accuracy. This tool also provides simplified Active Directory management through its 'management from report' capability that allows you perform user management tasks like enable, disable, unlock, delete user accounts right from the reports. ADManager Plus also serves as an effective automatic Active Directory management and reporting tool. And the highlight: you can achieve all these with just GUI based actions without even a single line of script.